Talk about painful! This patient ran into a tree branch. 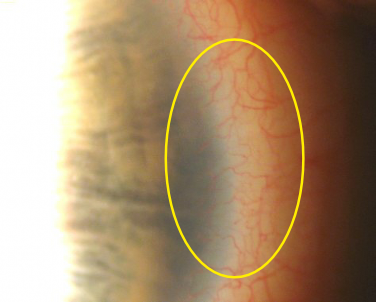 In the first photo you can see three "claw" marks across the entire front cornea. We placed a special dye which highlights these areas and helps to better assess the eye. 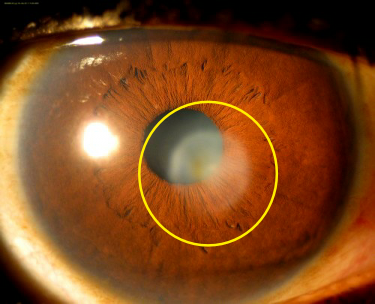 The cornea was cleaned of the loosely hanging tissue to reduce further chances of tearing and scarring. A specific bandage contact, medication, and pain management was prescribed. The second photo is of the same patient just 24-hours after the bandage lens was removed. Excellent outcome, no scarring, vision 20/20. Note: Vegetative and living matter (i.e. finger nail scratch) are very dangerous to the eye because of their ability to turn into a fungal infections. If you have a scratch to the eye from a "living matter" see your eye care professional promptly. This has been an on going tough case. An eye which has been scratched and has not healed well can become difficult to fix. The foundation of the eye is affected and thus the cornea can become "re-scratched" more easily. Our patient came in with a very scratched eye (picture 1). I removed the tissue which was not settling well to give the cornea a chance to heal completely. You can see in picture 2 how the cornea looks much cleaner. A bandage contact lens, some eye drops and a little prayer and we sent her home. Just after two days you can see the dramatic results: a clean complete cornea! WOW (picture 3 and 4). This patient has done well but does experience some dry eyes, which we are also taking care of.